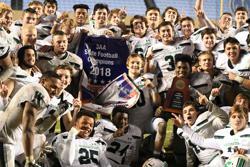 The Weddington Warriors defeated Southeast Guilford, 27-14, to claim their second 3AA state championship in three years. Weddington under first-year head coach Andy Capone dominated their competition in postseason play. The Warriors outscored their opponents, 195-46 in five games. Whitner Litton (Sr. quarterback) won the offensive MVP award completing 12-of-18 passes for 172 yards and two touchdowns. Eamon Murphy, (Sr. linebacker) received the defensive MVP leading the team in total tackles with nine and one interception. James Shipley, (Sr. wide receiver) was named the overall MVP with a game-leading 10 receptions for 113 yards and one touchdown. Shipley also threw one touchdown for 50 yards (to his brother Will) on the games most electrifying play. The play, dubbed by Coach Capone as Black Knight, was installed during this week's preparation and inspired by Army running the play in their game last week against Navy. The championship win is Weddington's 15th of the season, a school record and the program has now reeled off six consecutive seasons of double-digit wins.